Green Mountain 405 leads the White River Flyer around Loveland Curve near Norwich, Vt., on October 10, 2010. The vintage Alco RS-1 has polished the rails in its native Vermont for nearly 70 years. 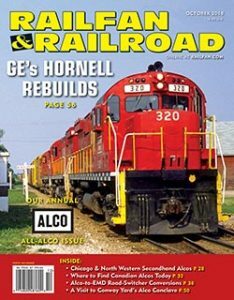 The Rutland Railroad, stretching almost the entire length of the state of Vermont and reaching into far upstate New York, was an Alco customer when the road dieselized, with steam departing for good in 1955. The railroad purchased nine RS-3s (200–208) and six RS-1s (400–405) in 1951. The Rutland struggled in a tough postwar economy. 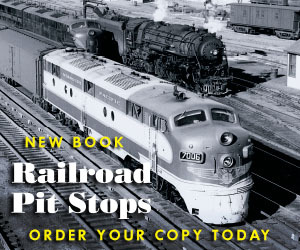 A strike closed the railroad for good in 1963, and the assets were scattered. The RS-3s were all sold to the Louisville & Nashville that year. The state of Vermont purchased the railroad and reopened the northern end of the line between Rutland and Burlington, operating it as the Vermont Railway. Meanwhile, F. Nelson Blount was establishing his Steamtown U.S.A. museum near the south end of the line at Bellows Falls. He petitioned for, and was granted, operating rights between Rutland and Bellows Falls, making it his Green Mountain Railroad. Meanwhile, the RS-1s were scattered. 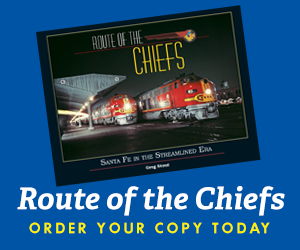 The 400 had left the roster in 1956, heading for the Tennessee Railroad as its 4; it would make another couple of stops before landing on the Arkansas & Missouri, where it runs today numbered 20. A trio — 401, 402, and 403 — went to the Vermont Railway, trading in their Rutland green for a bright red paint scheme. Eventually, 401 would travel to the Catskill Mountain Railroad in 1988, and 402 ended up on the Coopersville & Marne Railway in Michigan. The 403 went to Texas on the Sabine River & Northern where it was never used and scrapped. The 404 went to the Norwood & St. Lawrence in 1964, and was ultimately scrapped in the late 1980s. 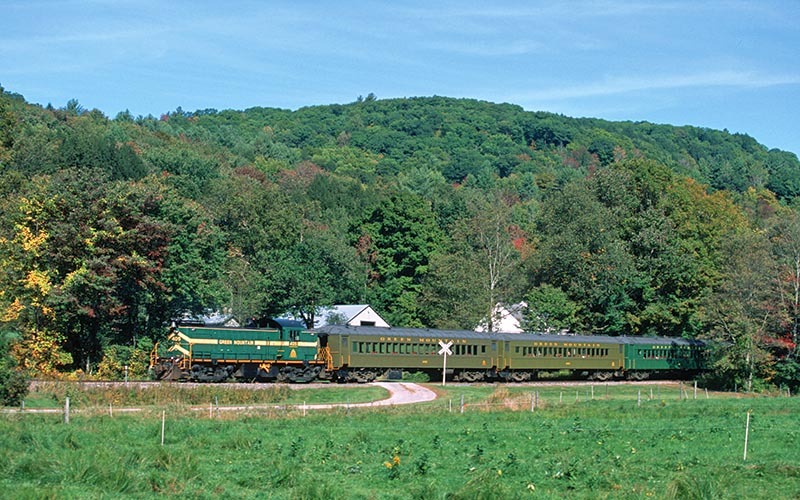 The Green Mountain Flyer sails past a bucolic farm near Gassetts, Vt., on September 26, 2015. 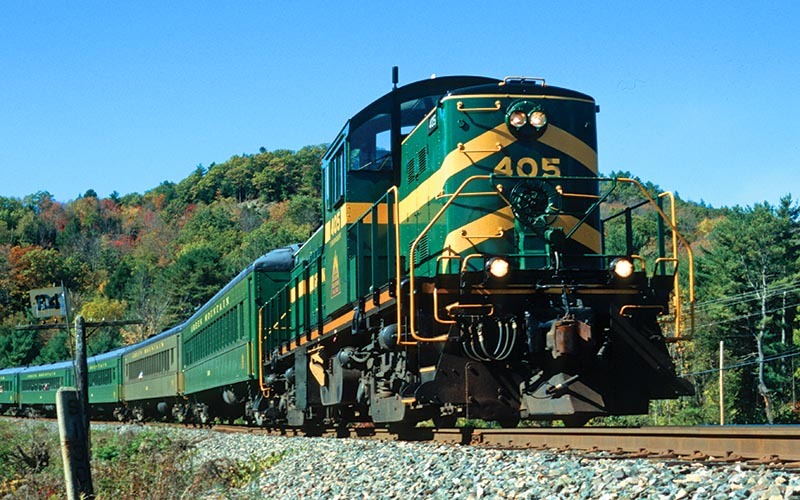 The 405 can usually be found on seasonal passenger excursion assignments at various locations on the Vermont Railway System each year. That leaves the 405, which was leased by Blount for use on the Green Mountain. In 1967, Blount perished in a plane crash; it took awhile to sort out his assets. When all was said and done, his museum and most of the large collection of steam locomotives went to the Steamtown Foundation, which ultimately moved to Scranton, Pa., in 1983. The Green Mountain started running passenger trains on its own after Steamtown left the area, with 405 handling many of those trains. In 1997, Green Mountain joined the Vermont Rail System, reuniting many of the former Rutland lines under single ownership for the first time since 1964. Through all of this, GMRC 405 has not only survived, but thrived. Under the watchful eye of Scott Whitney, the diesel remained in passenger service, hauling Green Mountain Flyer excursions and making the trek to White River Junction each year for that village’s “Glory Days of the Railroad” celebration. Whitney retired from GMRC this past year, leaving 405 behind as he heads for warmer climes. Alco fans are grateful for all his work in keeping 405 active as a tribute to the Rutland Railroad. Even though Scott has retired, his locomotive will continue to work the rails it has polished for 67 years in its native Vermont.